Full disclosure: for the first time in my entire life, someone actually sent me a product to review. I'm honored, flattered and pretty much as gitty as a school boy on Chunukah morning. You've been warned. Even before the nice folks at Screwpop central offered to send me one to play with, I'd had one on my wishlist. My primary interest: it's a handy tool that I thought I could bring places my Swiss Army Knife wasn't welcome - like through a TSA security line. I've carried a Swiss Army knife around for so many years I just feel naked without it. The Pros: The biggest advantage the Screwpop has over other clever multi tools I've used is that it just plain works. Unlike the disappointing Gerber Shard, this thing really delivers. The screw drivers really screw, the hex drive really hex's, and while I didn't try the bottle opener yet, I see no reason it wouldn't function well. The whole unit is actually quite sturdy, and large enough that you can get a good grip on the screwdriver for a descent amount of leverage. Another feature of the Screwpop that caught my attention was the fact that you can theoretically drop in any 1/4" bit. By carrying around the Screwpop and a collection of bits, you'd end up with the start of a compact and complete toolkit. Also, if your work calls for an usual screwdriver (say, a torx), you could drop that size in and carry it around. I was fortunate to be able to take the Screwpop traveling with me. I confirmed first hand that TSA didn't give it a second look. Also, while on the road I needed to open up some boxes and found the Screwpop's flathead screwdriver worked perfectly for this. Normally I'd have used my Swiss Army Knife, but the Screwpop made a perfectly good stand in. Another potential gotcha was my attempt to use some 1/4" bits from my electric screwdriver. The bits didn't quite fit, and when I did manage to jam one in, I had to use pliers to get it out. It's quite possible the fault here lies with the screwdriver's bits - perhaps they aren't exactly 1/4". I just know I was hoping for plug and play behavior, and I didn't find it. Finally, others have noted that the Screwpop uses a spring loaded ball-bearing to keep the bit in place versus a magnet. I too had second thoughts about whether the bit was going to stay in place, but it turned out to work just fine. 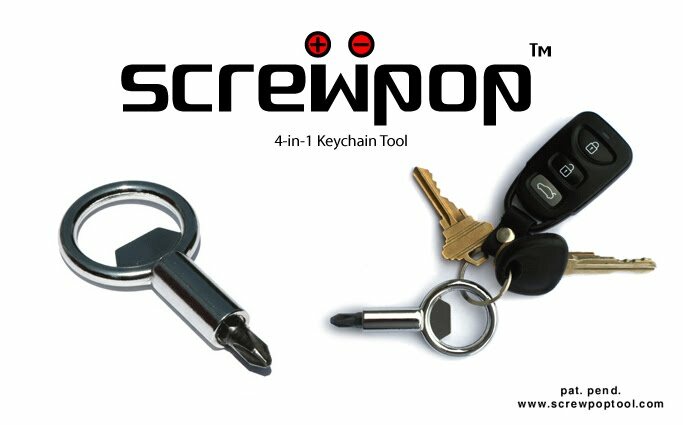 If your keychain isn't filled with stuff and you're looking for an item with real utility, or if you're looking for a handy tool for traveling - Screwpop is a winner. I won't be carrying mine every day, but I'll probably toss it into my small bag of extras I keep in my backpack at all times. It works too well to leave it at home.